This morning, the Duke and Duchess of Cambridge and Prince Harry attended a Christmas party at The Mix in London. The charity is one of the partners of the Heads Together initiative sponsored by the trio's foundation; the project aims to change the way mental health issues are discussed and supported. 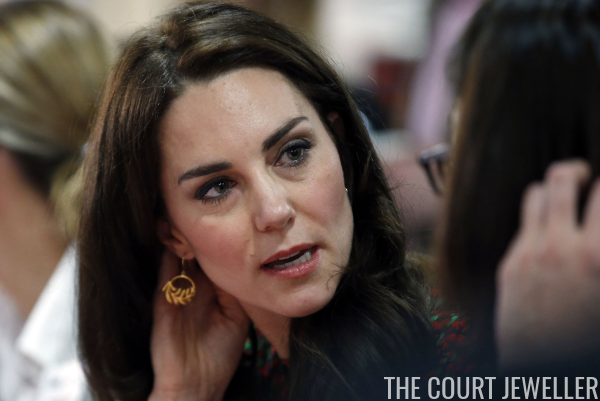 For the Christmas outing, Kate brought out earrings that have been in her jewelry box for some time: the Catherine Zoraida Fern Hoop Earrings. The earrings are made of 18ct gold plated silver, and they retail for £150. She paired the earrings with a festive dress. I actually like the holiday-appropriate red and green print of the frock -- I think it's fun! -- but I'm not crazy about the hem length.